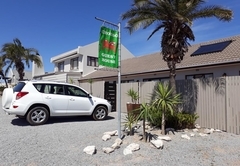 Croeso Guest House is a 3 star graded B&B with self catering option, offering Langebaan accommodation for tourists and visitors of on the Cape West Coast. 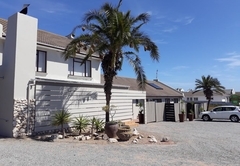 Croeso Guest House is 130 kms from Cape Town in the tranquil lagoon town of Langebaan, Jewel of the West Coast. 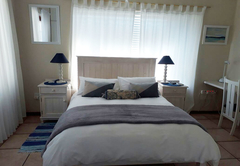 The Guest House is situated only five minutes away from the beach, restaurants, golf course, yacht club and West Coast National Park by car, or a 2-3 km walk into town. 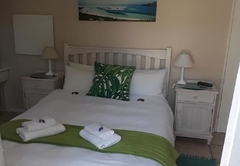 We cater for corporate and leisure travellers, windsurfing and kite-boarding enthusiasts, birders and holiday makers and can tailor make a package to suit your requirements for accommodation. 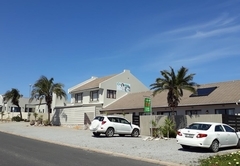 We have three separate, self-contained units of various sizes, which are equipped for self-catering. 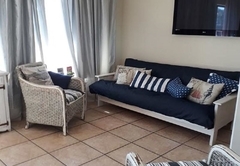 Units have a separate entrance, as well as an exit to a private patio with own braai area. All units are non smoking, but smokers are welcome to smoke on their own patios, which look out onto our pretty, enclosed back garden. 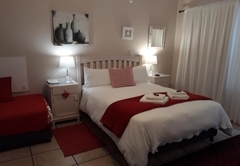 A large room with a double bed and a single bed, a full bathroom en-suite and kitchette /dining area. Equipped with: fridge, kettle, toaster and microwave for limited self-catering. A suite, consisting of an open plan lounge / kitchen and a separate bedroom with double bed and shower en-suite. Day bed in living area. Equipped with a fridge, kettle, toaster, microwave, snackwich maker and electric frying pan. 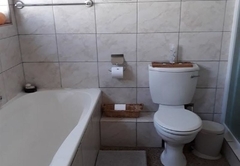 Two double bedrooms, each with own bathroom. A large open plan kitchen / dining and lounge area with sleeper couch. Equipped with: fridge, kettle, toaster, microwave, snackwich maker, electric frying pan, hotplate and convection oven. 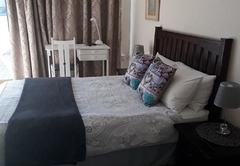 A large room with a double bed and single bed. 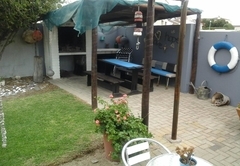 Leads out to garden and private patio with braai facilities. Full bathroom en-suite. 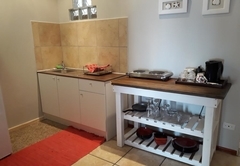 Kitchenette for limited self-catering with kettle, microwave, toaster, fridge /freezer, crockery and cutlery. 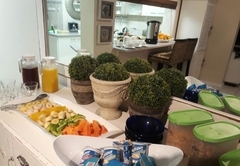 A suite, consisting of a separate en-suite bedroom and a living/kitchen area (with small sleeper couch for a child), dining counter with bar stools, hot plate, fridge/freezer, microwave, electric frying pan, toaster, kettle, crockery, etc. Apartment with 2 double bedrooms and 2 bathrooms. 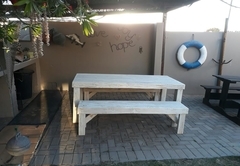 One bedroom leads out to private patio, garden and braai area. An open-plan lounge/dining room/kitchen with sleeper couch. Hot plate, microwave, fridge/freezer, crockery, etc. More economical accommodation for those that would just like to overnight. Modern with tea/coffee-making facilities and bar fridge. Big flat screen TV with DSTV hotel package. Free WiFi. No cooking facilities. Free parking in front of your unit. Standard Room with en-suite bathroom. No self catering facilities. Bar fridge with microwave and tea/coffee-making facilities. DSTV Hotel Package with free WiFi available. We just came back from spending the weekend at Croeso and all I can say is it was EXCELLENT Liz and Ron really made it feel like a home away from home , I would definitely recommend it to anyone who needs time away from the hectic city life. Thanks again and we will be back next year. Our stay at Croeso was amazing. 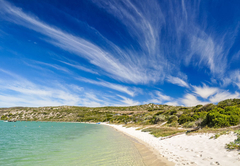 Liz certainly made sure that our first stay in Langebaan was extraordinary. Our cottage had everything we needed and even more. It felt like our home away from home. Will definitely be back. Would recommend Croeso Guesthouse to everyone. Thanx Liz! Response timeCroeso Guest House typically responds to requests in 5-10 minutes.